Pat Fenlon took heart from a second game without his Hibernian team conceding a goal, but warned his players they must work hard to improve. 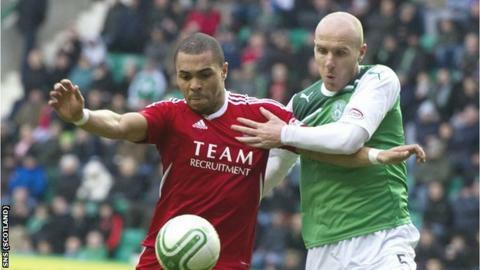 Hibs followed their Scottish Cup 1-0 win over Kilmarnock last week with a scoreless Scottish Premier League draw against Aberdeen at Easter Road. "It shows the hard work is paying off in relation to how we defend as a unit, not just as a back four," said Fenlon. "It is important we keep progressing and get ourselves up the table." And the Irishman added: "We can improve keeping the ball up front - it's got to stick to give our back four time to get up the pitch. "There is a lot of work to do. We have made progress with two cleans sheets, which is good. "It is not going to be a quick fix. "We'd like to make that three next week and if we can do that it will be a massive result for us." To achieve that, Hibs will have to repel SPL leaders Celtic when they visit Leith next Sunday. That will be no easy task, but for Fenlon the players' job is made easier by the support from the stands. "The atmosphere in the ground was good today," he told BBC Scotland. "The supporters are seeing that the players are working really hard to try to turn things around. "They really encouraged the players today to keep going for it and in fairness to Aberdeen they did that as well. "It was a decent game for a 0-0 draw."